Like one of Gob's little tricks ("They're illusions, Michael. 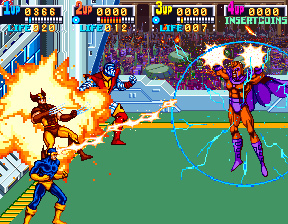 "), X-Men Arcade has been pulled from PlayStation Network without notice. The wacky thing is that it's still up on Xbox Live Arcade. Licensing issues? Excess of tachyon particles building up at Sony HQ? No official word has been released, so we're free to speculate and assume the worst! The disappearing act was first spotted by a NeoGAF user. Searching for the game on the European and US PlayStation Network simply returns no results. Even the browser page goes to 404, although some users report Gamestop digital copies still work just fine. Really, what we're supposed to do is pretend the game doesn't exist and has never existed on PSN. Let's just go along with that before Big Brother gets wind, ok? Current non-conspiratorial theories center around Konami wanting to push physical copies of the game over digital downloads. Kinda makes you long for the days of CD-ROM games and floppy discs, doesn't it? Nobody can take those away. NOBODY! Page created in 0.4775 seconds.